Burnet graduated from Marischal College in 1657. A generous benefactor to its library, he also sought to enhance his alma mater's loyalty to the Union by cultivating learning and the arts. The portrait formed part of the rehabilitation of Marischal College after the 1715 rising. Although the burghs of Aberdeen and both colleges were widely known for their strong Jacobite allegiances, the Union also had its supporters in the north-east of Scotland. 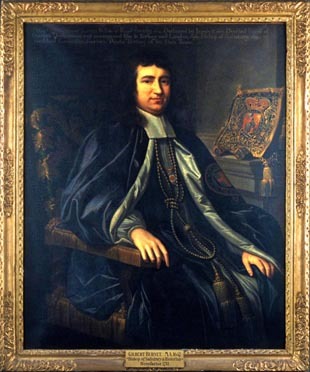 One of William of Orange's most prominent advisers, Gilbert Burnet, Bishop of Salisbury, was a graduate of Marischal. In 1711 Burnett fostered the college's loyalty to the Protestant and British constitution by awarding a number of bursaries to ensure students received the correct training in political and religious principles. Despite these attempts to generate loyalty to the Union, neither King's nor Marischal enjoyed a favourable reputation with the British authorities. Both were considered to be ideological and intellectual centres of Jacobitism; so much so that in the aftermath of the 1715 rising there were suggestions that the two institutions should be forcibly united.